Why have Medical Injectable treatment at Therapy House? Although you might associate nerve blocking injections with the treatment of lines and wrinkles, they are also licensed and clinically proven to be an effective treatment option for issues such as excessive sweating, gummy smile, dimply chin, and teeth clenching (Bruxism). If you are currently experiencing any of these issues, we can help you explore your treatment options – including but not limited to Botulinum Toxin injections – during an initial face-to-face consultation. There are a number of different treatment possibilities for issues such as excessive sweating or teeth clenching, and what’s right for one person may not be the right choice for another. Prescription-only injections cannot cure the conditions outlined above, but they have been shown to provide effective management of the symptoms for some individuals when used independently or in combination with other treatments. By arranging an initial consultation, you have the opportunity to talk about how a specific issue is affecting your day-to-day life and discuss specific recommendations about your treatment options with an experienced medical professional. What issues can medical injectables be used to treat? If your chin has lots of orange-peel textured dimples that are particularly visible when you cry, Botulinum Toxin injections can be used in some cases to prevent the muscles causing the dimpling in your chin from moving. A medical injectable treatment may be able to temporarily control the symptoms of hyperhidrosis – excessive sweating – in the underarm area. The treatment works by inhibiting the eccrine sweat glands from producing sweat, and can offer relief for up to six months. If you have a high lip line, your gums may be prominent when you smile. Botulinum Toxin injections may provide an option for subtly lowering your lip line to make your gums less visible. If you clench your teeth, either during the day or while you’re sleeping, Botulinum Toxin injections may offer temporary relief by restricting the movement of the muscles that you use to clench your teeth. When you come in for your initial consultation, we will spend some time talking to you to find out how a particular issue is affecting your life. Once we have the full picture, we will give you our recommendations about your different treatment options, based on what we feel would be right for you. When you have all the information you need to make an informed decision, we’ll arrange a convenient treatment appointment. During the treatment itself, we will inject a leading brand of medical injectables to temporarily relax specific muscles. The needles we use for this are very fine, which is important to give you a comfortable experience. Most people describe the injections as feeling like a tiny pin prick. We will clean the injection site with an antiseptic wipe before each injection. How soon should I see or experience the results? It can take five to ten days for these injections to take effect. We will give you an appointment for two weeks after your treatment so that we can check that you are happy with the results. A free top-up treatment will be administered, if required. Most people find the effects of their treatment last for up to four to six months. After this time, you may need a ‘top-up’ treatment to help you maintain the results. You may experience slight bleeding, or some swelling or bruising around the injection sites or a mild headache. These issues usually resolve within 24 hours. More serious side effects are rare if your injections are carried out by an experienced medical professional, which why it’s essential to choose a practitioner with the credentials and experience to offer this treatment. Side effects can include infection, swelling or facial asymmetry, depending on the treatment area. If you have any concerns or questions at all, please do call. Most people can carry on with their day as usual after their treatment, but if you experience swelling or bruising you may need some downtime for the symptoms to resolve. 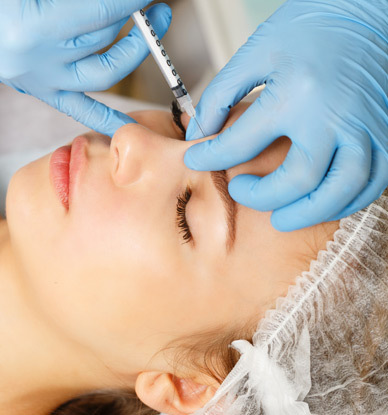 Want to know more about Medical Injectables?